Wakefield's Danny Brough missed a 78th-minute conversion as Warrington resisted a remarkable second-half comeback to move level on points with Super League leaders St Helens. Toby King set the tone for a dominant first half, collecting a kick to score. Further tries by Josh Charnley, Chris Hill and Blake Austin helped earn a 26-6 lead, with Ryan Hampshire's try getting the hosts on the board. An astonishing second-half by Wakefield brought five tries but Wolves held on. Warrington now have six wins from seven matches and join Saints, who have a 100% record from their six fixtures, on 12 points. The victory will come as a huge relief to Wolves, who looked like overpowering their out-of-sorts opponents early on. 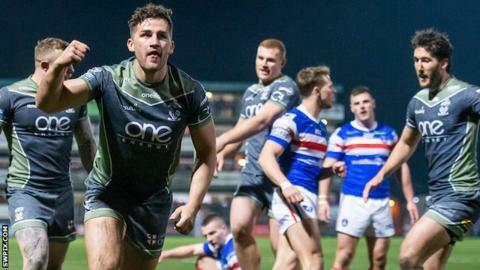 Trinity were without key injured duo Tom Johnstone, who is out for the season, and Bill Tupou, and trailed 18-0 after a blistering first 13 minutes. Charnley crossed out wide to add to King's effort and a third try arrived when Hill powered over the line, with all three scores converted by Stefan Ratchford. Hampshire got the hosts on the board after some nice handling out wide and Trinity responded impressively in the second period but the damage was already done. David Fifita's try gave the hosts a glimmer of hope but that seemed to fade when Charnley gathered a pass from Austin for his second converted touchdown to make it 34-12 with 22 minutes left. All-out attack brought Kyle Wood two tries in two minutes and set Warrington nerves jangling. But, although incessant home pressure brought two more late tries for Max Jowitt and Joe Arundel, Brough missed a couple of vital kicks and Trinity fell short despite outscoring their opponents by six tries to five. Wakefield head coach Chris Chester: "To come up short like that is a tough one to take. "They were far superior in the first half when everything seemed to happen too quick for us but that second half is what we're all about and I couldn't be more proud of them. "It comes down to one kick and I thought we were going to nick it at the end. But Broughy is going to win us more than we lose and we shouldn't have been in that position. "We scored some nice tries but that first 40 killed us." Warrington boss Steve Price: "We got a win and that's the most pleasing thing out of tonight. "I thought our first 40 minutes was outstanding. We were really polished in attack and defensively we were sound. "The last 22 minutes were like an avalanche, it was coming and we couldn't control it. "There are a few things we need to dust up on but it's credit to our playing group to hang in and come away with a win." Wakefield: Hampshire, Jones-Bishop, Lyne, Arundel, Jowitt, Miller, Brough, Fifita, Wood, England, Pauli, Horo, Crowther. Warrington: Ratchford, Charnley, King, Atkins, Mamo, Austin, Patton, Hill, D. Clark, Cooper, Currie, Hughes, Philbin. Replacements: J Clark, Tasi, Murdoch-Masila, Walker.